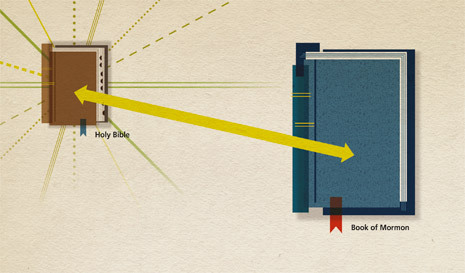 Some people may ask you why we need the Book of Mormon when we already have the Bible. In fact, Jesus Christ testified that this would happen (see 2 Nephi 29:3). There are many reasons why the Book of Mormon is important in our day (for example, see 2 Nephi 29:7–11). Here are just a few reasons why it’s essential. We know that “plain and precious things … have been taken away from” the Bible throughout time (1 Nephi 13:40). The Book of Mormon clarifies Christ’s doctrine and brings the fulness of the gospel to the earth once again (see 1 Nephi 13:38–41). For example, the Book of Mormon helps us know that baptism must be performed by immersion (see 3 Nephi 11:26) and that little children do not need to be baptized (see Moroni 8:4–26). Joseph Smith testified that the Book of Mormon is “the keystone of our religion.”3 Since we know this, it does not seem a coincidence that The Church of Jesus Christ of Latter-day Saints was organized on April 6, 1830, just 11 days after the Book of Mormon was first available for public sale on March 26, 1830. The Church was not organized until its keystone scripture was available for its members. Throughout April you’ll be studying about the Apostasy and the Restoration in your priesthood quorums and Young Women and Sunday School classes (if your ward or branch has the new lessons in your language). The coming forth of the Book of Mormon was an important part of the Restoration. After reading this article, think about how your life is different because you have the Book of Mormon. You could write down your feelings in your journal and consider sharing them with others by testifying at home, at church, or on social media. Mark E. Petersen, “Evidence of Things Not Seen,” Ensign, May 1978, 63. The Teachings of Ezra Taft Benson (1988), 204. Joseph Smith, in introduction to the Book of Mormon. Henry B. Eyring, “A Witness,” Liahona and Ensign, Nov. 2011, 69–70. Elder Tad R. Callister of the Presidency of the Seventy, “The Book of Mormon﻿—a Book from God,” Liahona and Ensign, Nov. 2011, 75.